Every artist big or small has to start somewhere, and Penn State is home to a lot of great local artists trying to get that start, including Mr. Jake Baker. Jake Baker didn’t just start his musical pursuits in college, though. Growing up seeing his father constantly play guitar inspired him at the age of 6 to try his own hand at the instrument, and it hasn’t appeared to have left it since. After being pointed in the right direction getting basic tips from his dad, Jake went off on his own to figure out the rest. Learning to play the guitar by ear, Jake’s story resembles that of many musically minded young men right down to his first band Almost Famous formed in 5th grade; naturally they played Blink-182 covers. Arlandria, his next band, was more creative with an electro-rock, The Cure influence, but that was his freshman year of high school and Jake’s realized his style aligns more with the solo artist, singer/songwriter category since then. Still it wasn’t until much later (this past Thanksgiving actually) that Jake started writing his own songs in earnest, and hopefully he’s sticking to it because he’s got talent and an awful lot of potential. His influences are rooted more in Jack Johnson/John Mayer-type music now, but judging from the artists he gets hooked on week to week, his sound is not going to be tied down to any one genre. This is one of Jake’s originals, “Fallen Dreams,” being performed at a Songwriters Club open mic event in East. It’s a nostalgic song with happy guitar, reminding the listener of the better times his honest, somber lyrics take them back to. When asked if it’s hard to write such honest music he said, “No, if I’m going through a tough patch, writing a song is how I get through it, it’s my way of expressing myself. It’s easier to write it and perform it than tell someone about it.” The songs he writes might be therapy for him, but for his expanding audience they’re a fresh breath of spring after a cold winter (something we could ALL use right now!). Another song he performed at the same open mic, “Swallowed by the Sea,” features more upbeat guitar with similar lyricism, alluding to the negativity we encounter in life without letting it get us down. The writing process for Jake is music first, lyrics later, which makes for a very organic sound; rather than try to fit music to words, Baker listens to what the chords sound like they’re about and goes from there. As a songwriter he’s very conscious of not letting his music get the best of him, always trying to do something new with each jam that catches his ear. Jake says when he’s stuck on a song, especially with structure, he always has his dad for advice, so his father is still a big influence on his music now. As you may have noticed, Jake Baker doesn’t have any official recordings he can show us, but with some support from the community here at Penn State we might be able to motivate him to make that a priority! “I want to find out my songs are on people’s iPods,” says Jake, mirroring the desire/struggle of most musicians. Recordings are his goal and that’s good to hear if we want to hear more of him. His short time so far spent with Songwriters Club has gotten him onstage a few times, and being in the club has benefitted him and other members alike through their mutual respect of each other’s songwriting techniques. 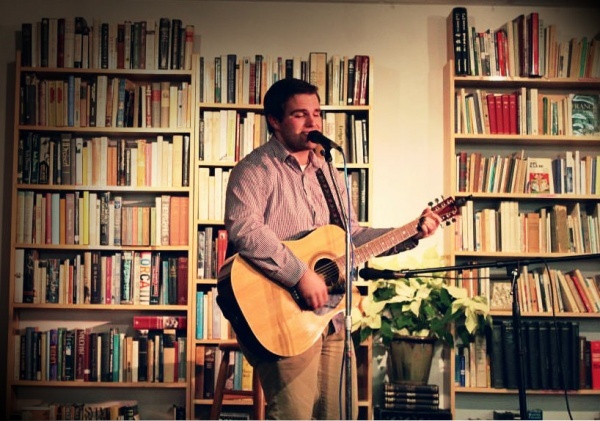 Jake Baker knows he has a voice, so now it’s up to his fellow Penn Staters to show him he has an audience to hear it!